From its jazzy main titles to its gentle fadeout, Monsters, Inc. has something that money can't buy. It's likeable. 92 min. Buena Vista Pictures Distribution. Directors: Pete Docter, Lee Unkrich, David Silverman. Cast: John Goodman, Billy Crystal, Mary Gibbs, Steve Buscemi, James Coburn. From its jazzy main titles to its gentle fadeout, Monsters, Inc. has something that money can't buy. It's likeable. The darn thing just puts a smile on your face. It's not especially deft in its plotting or surprising in its humor, but kids and adults alike will have a great time, and it seems churlish to ask for more, though we get it in an astonishing action finale that's the CGI-animated equivalent of being on Disneyland's Space Mountain ride. A product of the sharp cookies at Pixar, Monsters, Inc. is powered by a clever premise: that the scaring of kids by monsters in the closet is an industry, and—irony of ironies—the monsters are at least as scared of the kids as the kids are of the monsters. The city of Monstropolis depends on the success of dominant energy company Monsters, Inc, which scares, then harvests screams from children in order to power the monster world (company motto "We scare because we care"). Evoking a futurism seen through a mid-20th Century filter, the cavernous industrial center of Monsters, Inc. evokes the headquarters of the Men in Black: the factory lines up doors through which monsters make interdimensional passage into the world of human children. There, James P. "Sulley" Sullivan (John Goodman) is the star performer—eleven-time Scarer of the Month for the year to date—bringing in the most screams despite his genuine warm-hearted personality. His partner, Mikey Wazowski (Billy Crystal), is an eternally loyal friend who isn't wise but has a talent for wise-cracking. But there's trouble afoot: as CEO Mr. Henry J. Waternoose (James Coburn) puts it, "Kids these days! They just don't get scared like they used to." Jealous second-best scarer Randall Boggs (Steve Buscemi) is conducting secret plans of his own to overtake Sulley, and the lizard-like Randall accidentally unleashes a child into the factory. Though terrified at first, Sulley quickly takes to the girl—who he names "Boo"—and decides to hide and protect her. Shenanigans ensue, leading to a spectacular chase through the vertiginous storage vault holding thousands of doors. 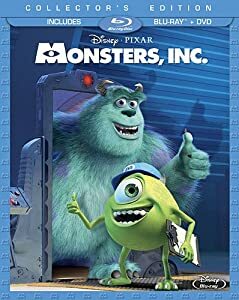 Though not quite on par with the very best of Pixar, Monsters, Inc. has many of the company's hallmarks: good humor, star performances both jocular and heartwarming, Randy Newman music and Gary Rydstrom sound design. Crystal is a riot as the green, pea-shaped cyclops Mikey, and Goodman's rough vulnerability perfectly suits Sulley. Jennifer Tilly, Frank "Grover" Oz, Bonnie Hunt, and Pixar mascot John Ratzenberger fill out the supporting cast. The end credits feature the peppy, old-fashioned Newman tune "If I Didn't Have You," enhanced by the vaudevillian rapport of Crystal and Goodman. What's not to like? Just in time to hype Monsters University, Monsters Inc. gets a spiffy new "Ultimate Collector's Edition," in a Blu-ray + Blu-ray 3D + DVD + Digital Copy combo pack. This five-disc set features just about perfect A/V quality that presents the film at its very best. Black level, color and contrast and detail and texture lose nothing in the translation to home video and, in all likelihood, gain in clarity and perfect calibration (there's only a bit of aliasing in Sulley's "fur," an artifact which may relate to animation techniques that have now been surpassed). In 3D, Monsters Inc. proves even more impressive, losing none of the pinpoint detail and gaining the dimension these designs always had in their computer files, but that we weren't experiencing to their fullest in a 2D presentation. Unlike some 3D conversions, Monsters Inc. very much lends itself to the added pop of 3D, certainly in its bold action sequences, and even in its relative quiet moments, which crackle with snappy visual comedy. Even more astonishing is the DTS-HD Master Audio surround mix—upgraded here for the first time to 7.1—which clatters thunderously in the film's showcase door-storage room sequence and impresses throughout with various soundscapes that never blot out the well-prioritized dialogue. The sets offers a fantastic array of new and old bonus features, beginning with an audio commentary by Docter, co-director Lee Unkrich, co-screenwriter Andrew Stanton and producer John Lasseter. The brand-new bonuses include "Outtakes and Company Play" (3D HD), the five-minute end-credits "gag reel" now in 3D; "Toy Story Toons: Partysaurus Rex" (HD), the seven-minute theatrical short that debuted in front of Finding Nemo 3D, and a three-minute promotional "Sneak Peek" at Monsters University. The rest comprise a full complement of terrific but previously issued bonus features, such as this film's edition of Pixar's "Filmmakers' Round Table"s (21:35, HD), with director Docter, co-director Lee Unkrich, producer Darla K. Anderson, and story supervisor Bob Peterson. As always, the Pixar folks warmly and sometimes excitedly share reminscences about the development and production of the film in question. This is the set's essential bonus feature, though there's plenty more to enjoy. The classic Pixar short "For the Birds" (3:28, HD) comes with optional audio commentary by director Ralph Eggleston. "Mike's New Car" (3:47, HD) comes with a ridiculously charming optional audio commentary by the filmmakers' sons. There's also the cool game Roz's 100 Door Challenge (HD), as well as a full complement of featurettes carried over from the original two-disc DVD release. The Humans Only section gathers featurettes that include interviews with Docter, Unkrich, Peterson, Anderson, John Lasseter, Billy Crystal, John Goodman, James Coburn, and Randy Newman, as well as extensive tours and behind-the-scenes demos on the Pixar lot. There's the self-explanatory "Pixar Fun Factory Tour" (3:46, SD) and a Story area with the featurettes "Story Is King" (2:03, SD), "Monsters Are Real" (1:31, SD), "Original Treatment" (13:43, HD) and "Story Pitch: Back to Work" (4:39, SD). The Banished Concepts area includes "Intro to Banished Concepts" (:32), "Assistant Sulley" (2:14, HD), "End of Day" (2:35, HD), "Bad Scare" (3:00, HD), "Scream Refinery" (1:07, HD), and "Original Sulley Intro" (:59), all of which discuss or present deleted scenes or rejected story points. Storyboard to Film Comparison serves up "Storyreel," "Final Color," and "Split-Screen Comparison" (all 5:42, HD) versions of one sequence. Here too is an Art Gallery. "Designing Monstropolis" (2:51, SD), "Set Dressing Intro" (3:22, SD), and "Location Flyarounds" (7:25, SD) go behind the scenes of design departments and offer "location" footage. Monster File includes the featurettes "Cast of Characters" (5:54, SD) and "What Makes a Great Monster?" (1:27, SD). The Animation area gathers "Animation Process" (3:14, SD), "Early Tests" (8:05, SD), "Opening Title Animation" (2:09, SD), "Hard Parts" (5:01, SD), "Shots Department" (2:15, SD), and a Production Demonstration that includes "Production Demo Intro" (:42), "Storyreel," "Layout," "Animation," and "Final Color" (1:50, HD). Music & Sound gets into the "Monster Song" (3:17, SD) and "Sound Design" (4:16, SD). Release archives "The Premiere" (:58, SD), two Trailers, four TV Spots, "International Inserts" (1:08, HD), "Multi-Language Clip Reel" (3:47, HD), "Toys" (1:32, SD), "Outtakes and Company Play" (5:27, HD). "Wrap Up" (:46, SD) leads to six "Easter Eggs": "Atrium Design" (:28, SD), "Pixar Air Show" (2:13, SD), "Early Animation Test" (:45, SD), "Animation Gag Reel 1: Sulley/Boo/Waternoose" (:12, SD), "Animation Gag Reel 2: Giraffe Gag" (:32, SD), and "Animation Gag Reel 3: Sulley Bowling Boo" (:08, SD). And then there's the Monsters Only section. New Monster Adventures comprises "Monster TV Treats" (1:13, SD), two segments produced for the Japanese kids show Ponkickies 21 (:37 and :57, SD), and the "'If I Didn't Have You' Music Video" (1:11, HD). Behind the Screams serves up "On the Job with Mike & Sulley" (2:33, SD). Lastly, Orientation includes "Welcome to Monsters, Inc." (:56, SD), "Your First Day" (3:37, SD), and "History of the Monster World" (1:36, HD). 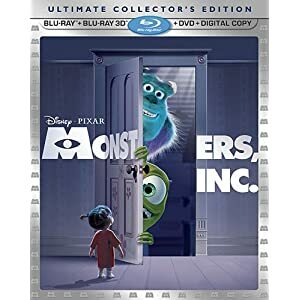 Only two bonus features go absent on this new edition (unless I'm missing them somewhere): an "Introduction by Pete Docter" (1:31, HD) and "Monsters, Inc. Ride and Go Seek: Building Monstropolis in Japan" (7:58, HD), with Docter and Disney Imagineers describing the cool Monsters, Inc. ride in the Japanese Disney theme park. Few will miss these features, but they're the only reasons for collector's to consider holding on to the previous Blu-ray issue. Needless to say, this is a thorough special edition of a beloved Pixar film, and HD and new extras are reasons enough for an upgrade in this stellar combo-pack, a good-value investment. All site content © 2000-2019 Peter Canavese. Page generated at 04/20/2019 07:53:41PM.